Dreaming of the perfect honeymoon in Paris ? Check into one of these 6 stunning suites that overlook the famous landmark. The Eiffel Tower is one of the most famous monuments in the world, featured in countless movies and photographs. It's been replicated in world's top destination such as Las Vegas. If you are looking for the ultimate room for your trip, book a suite with a view of the Eiffel Tower. Wake up to the view of the famous landmark first thing in the morning and have breakfast with a stunning view from your private terrace. The atmosphere is especially romantic when the lights come on at night. Each one of these accommodations is unique in its own way, perfect for a romantic proposal or a special celebration. 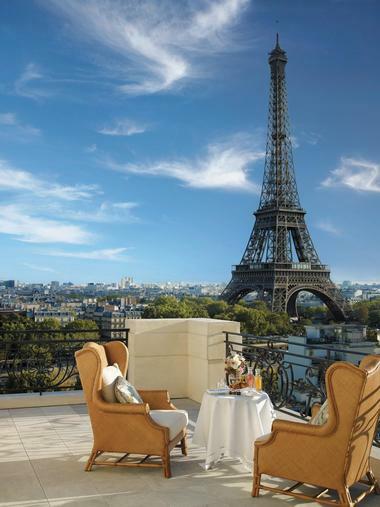 You'll be able to enjoy incredible views of the Eiffel Tower from the outdoor terrace at Shangri-La Hotel. In fact, you may decide that you don't even have to leave the room to immerse yourself in this romantic city. The hotel is located in a 19th century palace in the heart of Paris, near great shops, restaurants and historic attractions. The property has a beautiful indoor swimming pool with an outdoor terrace. Carita spa offers a diverse menu of treatments, from massages to facials. There are 101 elegant rooms and suites, decorated in shades of blue, white and ecru, drawing inspiration from grand European and Asian traditions. Each guest room and suite has a plush bathroom with a tv and a plush bath, perfect for soaking after a day of sightseeing. 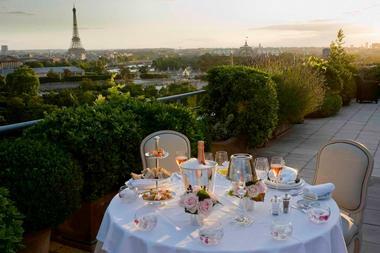 If you are planning a romantic trip to Paris, book the Shangri-La Suite which has a giant terrace with lounge chairs from which you can enjoy unobstructed views of the Eiffel Tower. Choose from a variety of flavors and settings Dine at the Micehlin-starred L'Abeille, under a stunning glass cupola at La Bauhinia or the Michelin-starred Shang Palace serving authentic Chinese dishes. Le Bar features authentic Empire decor and offers guests an extensive wine cellar. 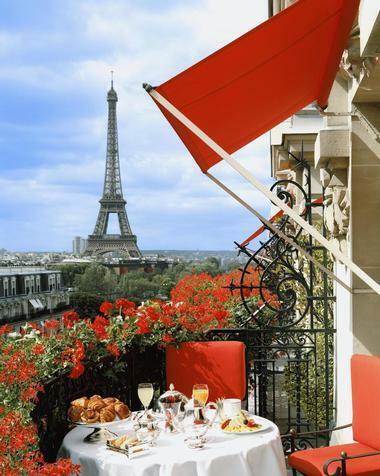 This photo taken at Hotel Plaza Athenee couldn't paint a more perfect picture of a romantic breakfast with a view of the city. The red accents are stunning and the view couldn't be better. 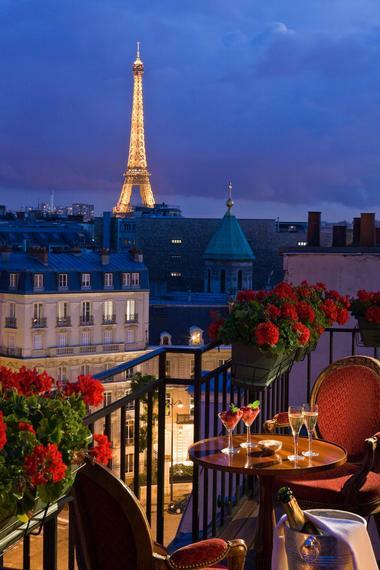 You don't have to spring for a penthouse at Hotel San Regis Paris to get a view of the famous tower. Checking into the Deluxe Junior Suite will do. Celebrate on your own private terrace with champagne and chocolate covered strawberries. 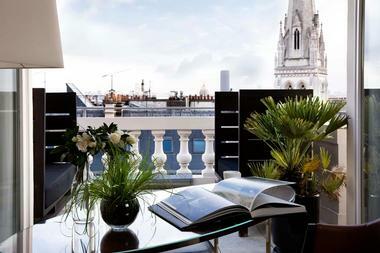 Hotel San Regis Paris is an intimate luxury hideaway located in the Golden Triangle, near the Champs-Elysees. At the San Regis you can expect attentive service, stylish period decor and privacy. You'll be just a block from the avenue Montaigne and rue du Faubourg Saint-Honore, famous for boutique shopping. There is a sense of tradition, and many members of the staff have worked here for years. They are quick to note your preferences, so when you return you can feel comfortable and pampered. The concierge Jean-Francois Chauvin who has earned the Cles d'Or for his expertise, is the best person to call if you need last minute tickets or restaurant recommendations. The 33 guest rooms and 11 suites are individually furnished with period furniture such as Napoleon III, Louis XV, Chippendale and Empire. Color themes in guest rooms vary from deep reds and bright yellows to soft blues and flowery patterns, so when you are making your reservation ask for the color combination that is best for you. The rooms are equipped with high speed internet, so that you can stay connected while you travel. The restaurant has a feel of a private dining room, complete with oak paneling and rich fabrics. Doubles start at Euro 395, depending on when you go. Lower rates are sometimes available during low season (+33-(0)1-4495-1616). 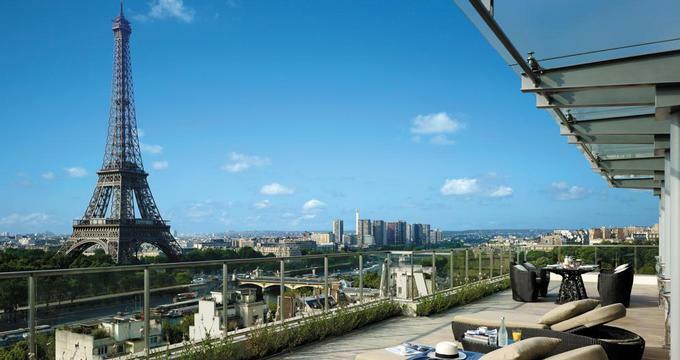 The Eiffel Duplex terrace at Fouquet's Barriere offers a spacious layouts and views of the famous landmark. Fouquet's Barriere is a luxury hotel located between Champs-Elysees and Avenue George V. The hotel's ideal location lets you explore top tourist attractions in the city with ease. Enjoy scenic views from your room and five excellent restaurants. There are 48 luxurious rooms and 33 spacious suites. 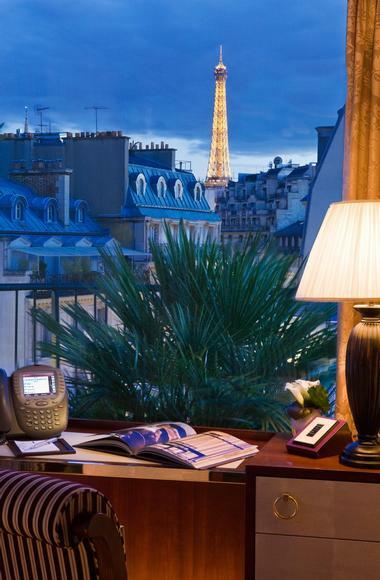 Ask for an Executive Champs-Elysees Room for stunning city views. Fouquet's restaurant is an authentic Parisian brasserie with a festive ambiance depicting the origins of cinema. La Petite Maison de Nicole serves Italian cuisine. The Michelin-starred Le Diane has a gorgeous interior garden and prepares classic French dishes. At the Galerie Joy, Terrasse et Jardin Joy, you will enjoy sipping cups of tea while overlooking the famous avenue. Food classics, ice cream, an array of homemade pastries and a menu from Fouquet's are served at Cafe Fouquet's. Le Lucien Bar serves appetizers, vintage champagnes and cocktails with live music. Marta Le Bar, named in honor of hotelier Lucien Barriere's wife, welcomes you with delicious snacks and classical craft cocktails. Bar de L'escadrille serves cocktails with beautiful views. U Spa Barrier is home to one of the largest pools in Paris. Work out at the fully equipped gym and relax with a massage. The spa offers balneo-therapy facilities, sauna and hammam. Take golf lessons from the hotel's in-house instructor or play on the 18-hole, par-72 Le Golf National championship golf course. The course is also known as L'Albatros, the home of the French Open, and is located 20 miles from the hotel. For children, the hotel offers the exclusively designed The Diwi & Co program which consists of educational and fun activities. Explore nearby attractions, including the Avenue George V, the The Arc de Triomphe and more. Paris is one the most romantic cities in the world which makes it the perfect place to get married. The hotel can host intimate weddings of 10 or grand events with up to 1,000 guests. Rooms start at 690 Euro per night (+33 1 40 69 60 00). Book this stunning room with a spacious terrace at Le Meurice, a luxury getaway located in the center of the city overlooking the Tuileries Garden, near Palais Royal and the Louvre. This Parisian landmark hotel has attracted important guests including kings, ministers, artists and actors since the 18th century. The property features lavish interiors, mosaic floors, hand-carved moldings and spacious lounges with high ceilings. The hotel is filled with antiques and art from Sotheby's and Christie's. The reception area leads into three main public spaces: the restaurant Le Meurice, the Bar Fontainebleau and Le Jardin d'Hiver (the Winter Garden). Le Jardin d'Hiver feels like a garden with a century-old Art Nouveau-style glass roof, palm trees and 70 kinds of exotic flowers, including 20 varieties of orchids. The Jardin d’Hiver serves meals and afternoon tea in apricot glassware and custom-designed china. Guests who desire peace and quiet can escape to the hotel's Spa and Fitness Center built around an inner courtyard. The spa, decorated with marble, wood, stone, and glass, features Valmont treatments. The property offers luxury soundproof rooms, each uniquely decorated with fine furnishings and luxurious fabrics. The first floor Presidential Suites, the fourth and fifth floors are decorated in Louis XVI style. The second and third floors feature less ornamental decor suitable for business travelers. The third floor is done in Empire style, and the sixth-floor is very intimate and distinctly Parisian in style. Some of the guestrooms have hand-painted ceilings depicting the sky. Others features canopied beds or marble fireplaces. The bathrooms use colorful red and ochre marble from the Pyrenees, and Italian marble. Some bathrooms have alcove tubs and most have natural daylight. Restaurant Le Meurice serves Parisian cuisine in an opulent setting with crystal chandeliers and ornate mirrors. Walls are adorned with landscape paintings. The china was specially created to match the mosaic patterns on the floor. Bar 228 serves cocktails, whiskies, cognacs, armagnacs and Dom Perignon by the glass. The hotel is located between the Place de la Concorde and the Louvre. The property is about 40 minutes by car from Charles de Gaulle airport, and 30 minutes from Orly and Bourget airports. Rooms start at 720 Euro per night (+33-1-44-581-010). 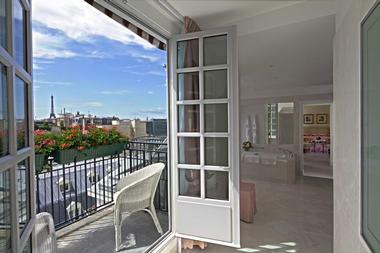 The Honeymoon Suite at Hotel Bristol has a private outdoor terrace with a view of the Eiffel Tower. Famous for its rare oversized rooms and romantic atmosphere, Hotel de Sers is a five star getaway located within minutes of the Champs Elysees in Paris, France. Work out in the fitness center, and relax in the sauna and steam room. There are fifty-two rooms and suites: superior and deluxe rooms, seven luxurious suites and apartments, some with panoramic views. ll rooms have internet access, air conditioning, mini bar and DVD player with DVD rentals available. The restaurant is located just off the lobby and extends into a tree lined courtyard. The marble floored main area is light and airy with a minimalist elegance. The property is about 40 minutes from Charles de Gaul Airport. Rates start at Euro 625 for a superior room (+33 (0)1 53 23 75 75).